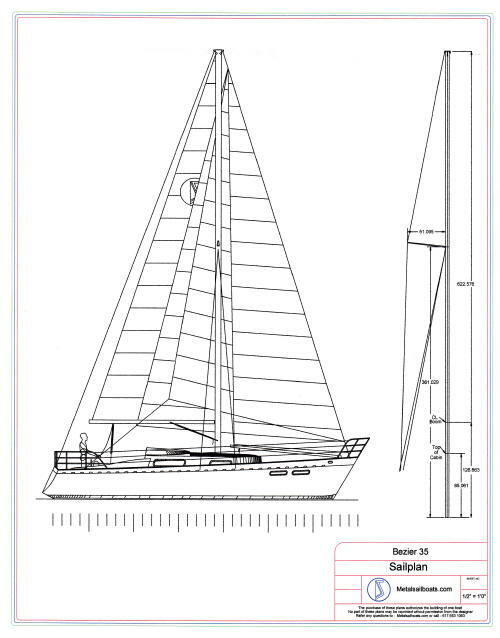 The Bezier 35 is a true round hull design using the "Bezier Curve" design and construction method which was developed and pioneered by metalsailboats.com. 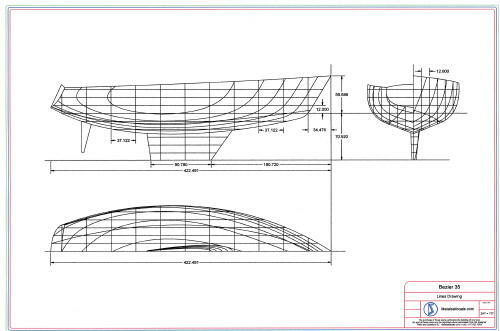 Frame construction is conventional for a metal hull with closely spaced longitudinals supported by transverse flat bar frames. 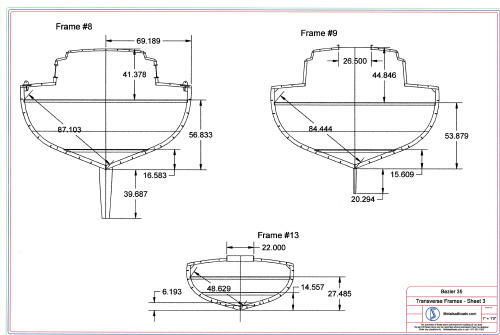 This framing system assures a fair hull, and a strong one, yet is within the ability of a competent amateur builder. 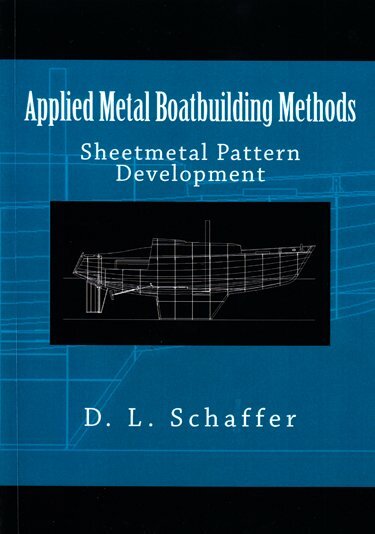 There is diversity in the Steel Boat Plans for the Bezier 35 by providing overlapping building teckniques. 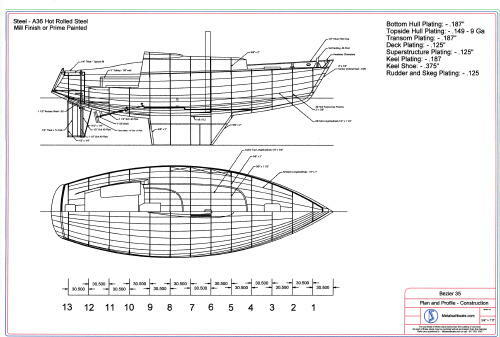 For example the hull longintudinal frames may be CNC cut or by using the full size patterns the longintudinal frame can be saw cut or rolled formed by hand. The same is true for the transverse frames and shell plating. 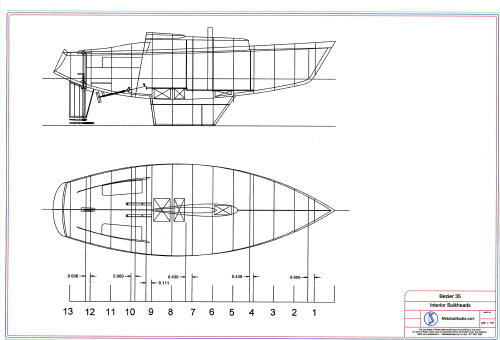 The Steel Boat Plans for the Bezier 35 detail an underbody with a Fin keel and skegged rudder for good directional stability. A tall mashead rig is well suited to coastal crusing or ocean passages. 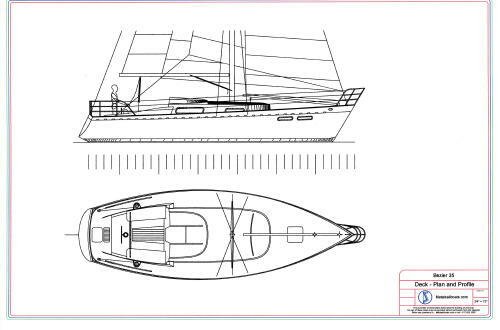 The Steel Boat Plans also detail full head room through out with a large Vee Berth forward, a single sea berth on the starboard side, a drop down table provides another berth to port. There is a full galley and head, deep hanging lockers, and storage thruout. 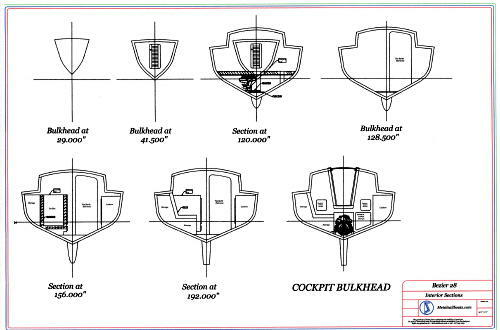 In this day of electronic navigation a standup navigation station is provided, by mounting navigation equipment, in the deep bulkhead between the galley and the main cabin area. Accessed from the galley side. On deck there is an anchor and chain locker forward, Storage under the cockpit seats, and lazerret storage aft of the rudder. 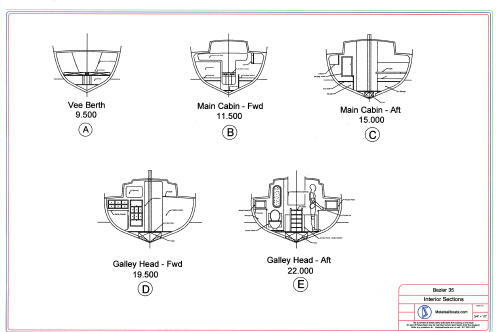 Length on Deck: --- 34' 0"
Length Waterline: --- 30' 11"
Beam on Deck: --- 11 6.5"
Beam at Waterline: --- 10'1.5"